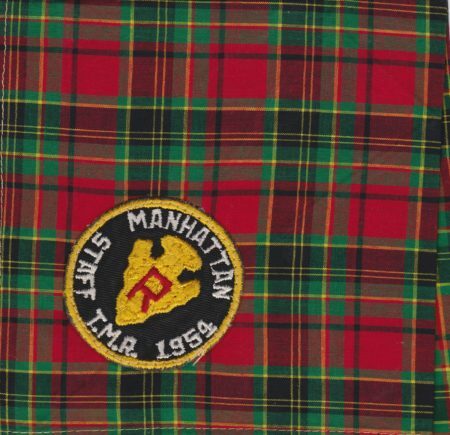 Ten Mile River Trader » Blog Archive » Camp Manhattan 1954 ‘R’ Staff Neckerchief. Here is an another example of a Staff neckerchief from a time when scouts camped at Ten Mile River by borough. As you might imagine, Camp Manhattan was for scouts from that borough and was located on Crystal Lake. The area which comprised Camp Manhattan was later divided into Camp Rondack and Camp Keowa. What makes this unique, is there were two versions this year, one with an ‘R’ and one with a ‘K’ As you may suspect, the ‘R’ was for Rondack. Beginning in 1955 both Camp Keowa and Camp Rondack each had their own names on their memorabilia. I’ll have to pull my K version and post that too.